Just stamps, ink, and paper… and a bit of ribbon. And if you order everything on the supply list it will be just barely over the qualifying order to get the Lovely Lattice stamp set for free. It’s one of the selections you can make during Sale-a-Bration, Stampin’ Up!’s biggest sale of the year. Or add the Stamparatus and you that qualifies you for a second Sale-a-Bration item. How cool is that? 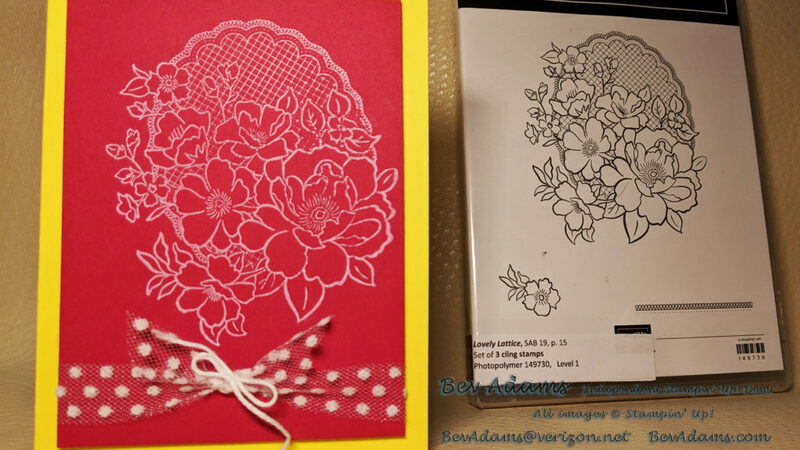 Tip: Add the Lovely Lattice stamp set to your order after you have added all the other items. When your total reaches $50 (in the US) you can then add the free stamp set. If you need an Occasions catalog and a Sale-a-Bration brochure, you can email me and send me your address as well so I can send you a catalog. I’d love to be your demonstrator! Shop Now and use the Host Code 99E326V2 good until April 4rd at 2:00 pm Pacific Time. Collect Frequent Shopper Rewards for free products from me.